The Monarch 5 4-20x50 ED riflescope is one Nikon’s most advanced riflescopes. The Monarch 5 4-20x50 ED features the Advanced BDC reticle etched into Nikon’s legendary Extra-low Dispersion (ED) optical glass. 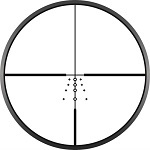 The Advanced BDC Reticle features windage marks horizontally positioned next to the drop point on the vertical post. This long range scope uses a 5x zoom ratio perfect for sighting in on targets at long ranges. The Nikon Monarch 5 4-20x50 ED riflescope features a large ocular lens that deliver an ultra-clear and ultra-bright sight picture is most light conditions.